If you have chosen to preserve your gown, Yale uses a museum quality heirloom box. Your dress will be carefully filled with acid-free tissue paper and folded in a breathable paperboard box. 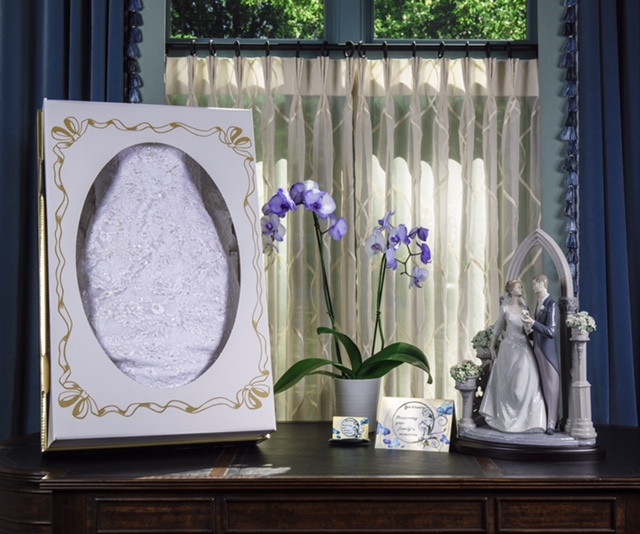 This acid free box will maintain the beauty of your gown for years to come. For added protection, Yale Cleaners also utilizes a muslin cover which provides a buffer against light, humidity and other contaminants. Headpieces, veils, programs, glasses, shoulder pads, shoes and bra cups will not be placed in the box with your dress. These items must be stored separately to avoid color changes and permanent damage to your gown. Yale gladly offers an accessory box that can be purchased to accommodate these items. Whether having worn a new gown or an heirloom, most brides want to preserve their gown. We encourage you to have it cleaned as soon as possible following your wedding day. It is very important to get all the stains (seen or unseen) removed before storing the dress. Stains left untreated for an extended period of time are often impossible to remove or can even cause holes to form. When you bring Yale your gown, we will carefully and completely inspect it for damage and stains. Our trained professionals will remove the stains by hand, gently clean your gown and re-inspect it before it's pressed. Your dress requires special care, and our custom built dry cleaning machines and presses are designed to safely do just that. Trust Yale's team of experts to give your gown the attention it deserves.